So I haven’t been that great with my blogging in the past couple of weeks – mostly due to a previously mentioned insane busy period at work. I am glad to report that that period is over! I am happy to be back to blogging and will have a few fun posts up this week – stay tuned for my first attempt at making fattoush! I recently returned from a business + pleasure trip to Toronto and when I looked back at my pictures, I realised that a lot of them were of food. Let’s face it, there’s some good food in Toronto. 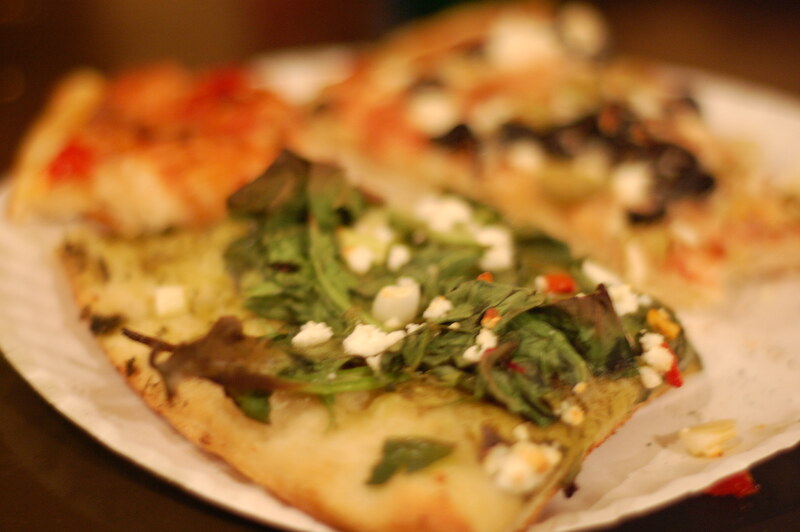 This particular shot was taken at Amato Pizza, possibly one of the best pizza spots in the city. Nothing fancy, just good pizza. While we’re on the topic of food – another great spot that I visited during my trip was Fressen – definitely the best vegan restaurant that I have been to so far. My cousin and I ordered this fabulous zucchini appetizer and I had the seitan and veggies for my main. No regrets whatsoever. For desert, we shared a chocolate avocado tartine. Besides the food being delicious, we were both extremely impressed with the presentation of the food. Two other blog-worthy restaurant visits in Toronto this week were Grazie and Tabule, both mid-town around Yonge and Eglinton. Grazie has got to be my favorite Italian restaurant in TO. I highly recommend the Penza (penne à la vodka). Tabule is great if you are in the mood for really good Lebanese food. I am glad this place opened up because Toronto doesn’t have a ton of Middle Eastern restaurants. This one is definitely a good spot. All in all, such an amazing and refreshing week in Toronto. I am ready to be back home to J and to return to daily life in the O-town. Thanks for reading!